It should be no mystery to anyone that EDs see more than their share of fireworks injuries on July 4th and hangovers on New Year’s Day. But what about on Halloween? Will there be a deluge of patients with candy overdoses? Since I couldn’t recall any specific cases from my own Halloween emergency department shifts, I did a casual search and found a few interesting trends. Halloween is the fourth most dangerous holiday for injuries to children after Labor Day, Memorial Day, and the 4th of July. It turns out that carving pumpkins can be a dangerous activity. The combination of a sharp knife, slippery pumpkin innards, and young participants increases the risk of hand and finger injuries, which account for the highest proportion of Halloween injuries. I can understand the high frequency of lacerations (1/3 of hand injuries), but I don’t quite understand the number of fractures (1/5 of hand injuries). My guess is that you are so mad after you cut your hand carving the pumpkin that you punch it in its partially carved face – hard enough to get a boxer’s fracture? If the pumpkin doesn’t cut or fracture you, remember there is always the chance it will burn you from the fire created by the candle you placed inside and forgot to extinguish. The strategy to prevent hand injuries is very simple – just use the dull, serrated, orange-handled knives made specifically for pumpkin carving that are available on every store shelf. These knives slice pumpkins safely, but they will hardly cut butter much less your fingers. Let the adults do the carving, or at least make sure they supervise the kids. Until everyone owns a pumpkin knife, my advice to EDs is to stock up on lidocaine and 5-0 nylon and keep 2 or 3 suture techs on call for Halloween. Don’t forget to perform and document a thorough hand exam, including tendons, nerves and vasculature. And send your favorite hand surgeon a bottle of pumpkin wine a few days later. The eyes are also vulnerable on Halloween. Costume props such swords, wands, feathers and wires can all cause eye injuries, as can the cosmetic contact lenses worn as part of a scary costume. According to the Consumer Product Safety Commission, falls account for some Halloween injuries, as you might suspect on any holiday that involves putting up and taking down decorations. Baggy costumes and vision-limiting masks also seem to account for injuries related to tripping and falling. With the pumpkin safely carved and the costumes donned, the real danger begins. The kids head out the door and face the most serious hazard of Halloween – getting hit by a car. According to 5 years of data from the Ohio Department of Transportation, a pedestrian is more likely to be struck by a car in the last week of October than any other time of year. Additional data from Fatality Analysis Reporting System showed that Halloween was the deadliest day for child pedestrian accidents over a 20-year period. Safe Kids Worldwide reports that twice as many children are hit and killed by cars on Halloween evening than any other day of the year. 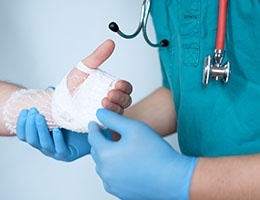 Emergency departments need to be prepared for an unusual pediatric injury lineup on Halloween: hand lacerations, eye injuries, falls, and serious auto-pedestrian trauma. The day after Halloween might herald a few cases of candy indigestion or adults who went trick-or-treating for beer who need work notes. Unless the rash of creepy clown sightings continues, you can tell the psychiatrist on call not to worry about coming to evaluate patients with acute coulrophobia.